OHAUS ADVENTURER™ BALANCES: NEW MODELS! 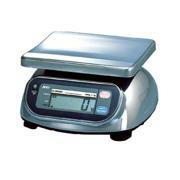 The Adventurer combines inventive features and uncomplicated operation to deliver optimal weighing results. 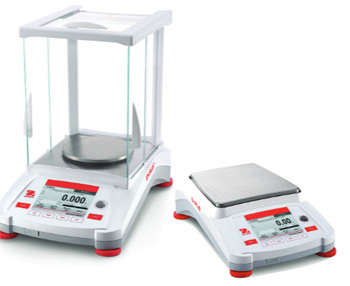 • Stability, Accuracy, and Fast Operation Ensure Optimal Weighing Results - This trio of characteristics ensures the most important aspects of routine laboratory weighing are covered: accurate results, achieved quickly, that you can count on. • Color Touchscreen & Connectivity Options Power a Modern Weighing Experience - The wide viewing angle color touchscreen offers quick access to all of Adventurer's applications. Dual USB ports and the ability to store GLP/GMP information assist in the monitoring and reporting of data. • Space-saving Draftshield Improves User Experience and Accessibility - The two piece, top-mounted draftshield doors open wide on both sides, providing ample room for sample placement, and also reduce the footprint of the draftshield in the rear of the balance when open. AX223/E supplied with draft shield. 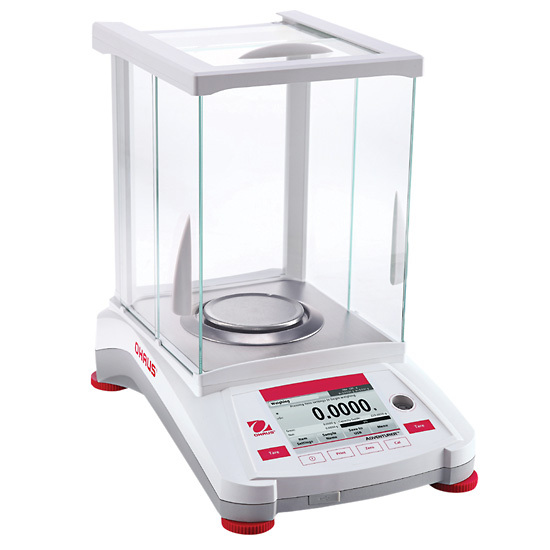 Standard Features: Large, high contrast LCD display, large stainless steel weighing surface, low profile, ergonomic design, integral security bracket, auto shut-off, sealed front panel and molded spill ring, stability indicator, error indicator, low battery indicator, span calibration mass included on 200, 400 and gram models only. OHAUS SCOUT SPX SERIES: NEW! Standard Features Include: -Bright Backlit LCD & 4 Button Control Enable Efficient Operation and Ease of Use Combined with a simplified 4 button operation, the Scout's large backlit display increases readability in low light working conditions, and is easier to view from a distance. -Bolstered by Superior Overload Protection and Impact-Resistant Pan Support Integrated superior overload protection and impact-resistant pan support safeguard against shock and overloading the balance in rugged and demanding environments. -Better Performance and Higher Capacities Widen the Range of Weighing Applications Stabilization time as fast as 1 sec and advanced weighing technology, lead toimproved productivity in your facility. Increased capacity unlocks a widerrange of weighing applications. Other Standard Features and Equipment: Transportation lock, stainless steel pan, menu & calibration lockout switch, slip-resistant and adjustable feet, leveling bubble, mechanical and software overload/underload protection, stability indicator, auto tare, low battery indicator, auto shut-off, user selectable printing options, user selectable communication settings. 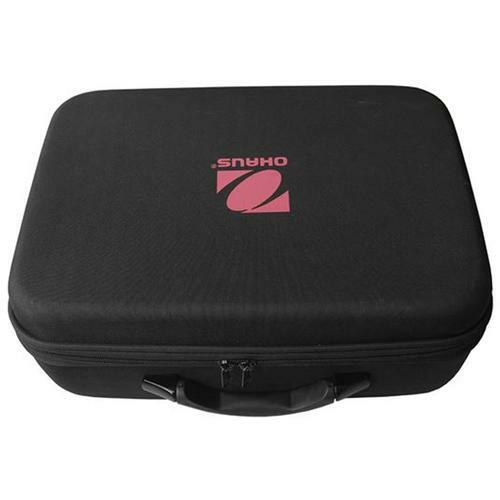 Hard shell carrying case for Ohaus Scout series digital scales. 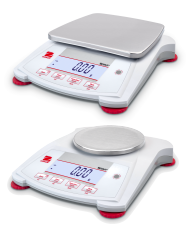 Ohaus Compact Scales are ideal when cost matters and dependable results are a must. 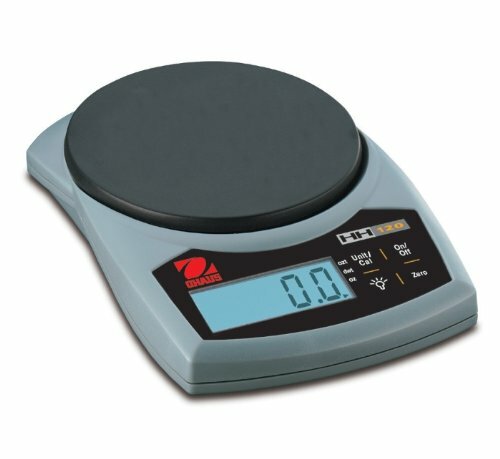 These uniquely designed scales have a wide variety of applications, more than any other scale in their class. The four portable models range in capacities from 200g to 5000g, and are perfect for use in light production, in the field, the kitchen, the office, and more. 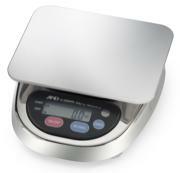 Easy operation, long battery life, and great performance make Compact Scales a truly remarkable value. Standard Features: Low battery indicator, overload and underload indicators, auto shut-off, rugged plastic construction, tactile feedback keypad. Calibration weights not included. 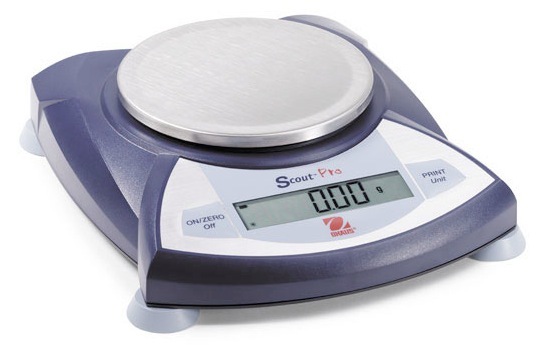 Convenient, compact, portable weighing capability in the palm of your hand! These little scales with sleek styling and convenient size are ideal to take anywhere throw it in a briefcase, or slip it in your pocket. 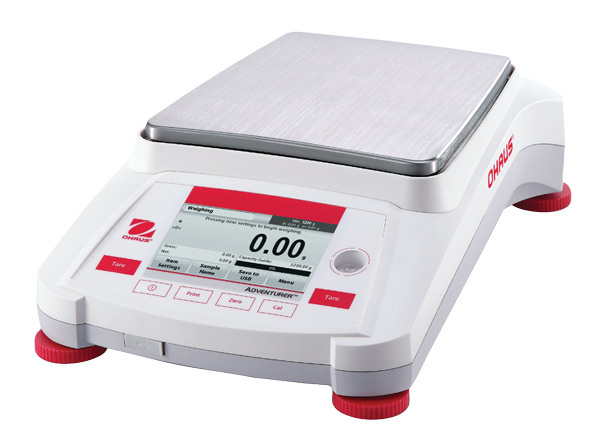 Whether you choose the Standard model with basic grams weighing, or one of the Professional models with multiple weighing units, the Ohaus Hand-Held Series offers outstanding performance and exceptional value. Standard Features: Low battery indicator, overload and underload indicators, 2-AAA batteries, rugged plastic construction. Button activated luminescent display, snap on protective molded cover, soft tactile feedback keypad, low battery indicator. All Ohaus hand-held scales are protected by a 12 month warranty on labor and parts. OHAUS PS pocket scales deliver great performance in a unique stylish yet functional design. The combination pan and cover slides back for weighing and forward to cover the display and keys for storage or transport. Two mechanical buttons and a crisp LCD allow for simple, quick operation. Operating Temp. 18° to 25° C / 65° to 77° F at 10% to 80% Relative Humidity Non-condensing. Sturdy low form balance with magnetic damping and zero adjustment knob. 6" diameter stainless steel plate. 610 gram capacity, sensitive to 0.1 gram. Capacity can be increased to 2610 grams with the optional weight set. Extra weight set can be stored in the contoured base. 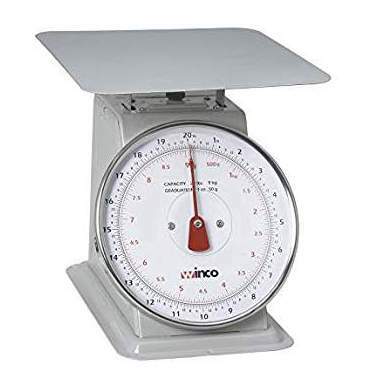 Standard Level Washdown Precision Bench Scales feature a stainless steel indicator with square stainless steel base and NEMA 4X/IP66 full washdown protection, excellent for washdown environments. Includes RS232 interface with GMP/GLP data output. • Display: LCD display with white LED backlight plus 3 color checkweigh LED. 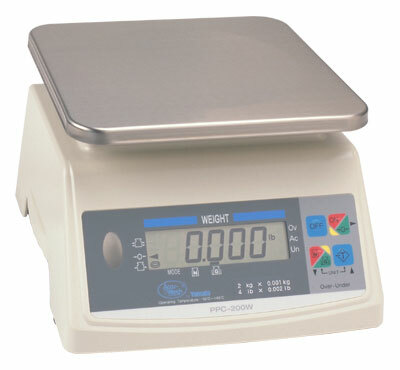 A&D Weighing SK-WP digital scales are especially designed as "Pro Portion Control Scales" for both business and home use. They are dust proof and waterproof, which make them perfect for ultimate hygiene. These portable scales would allow operation virtually anywhere, even in areas without power! 1000 g to 20 kg capacities. 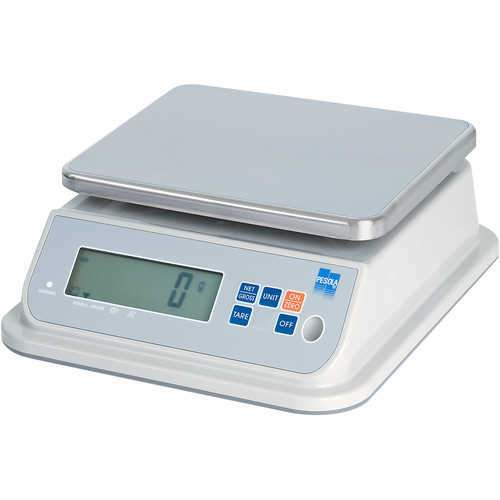 Designed for exceptional durability, this scale is rated IP68 waterproof and dustproof! 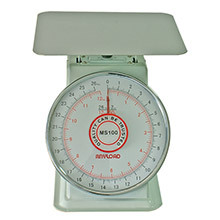 Weights are displayed in kilograms or pounds on the scale's large, backlit LCD. Other features include a simple counting function, auto-off, a hold function, user calibration, and leveling feet. 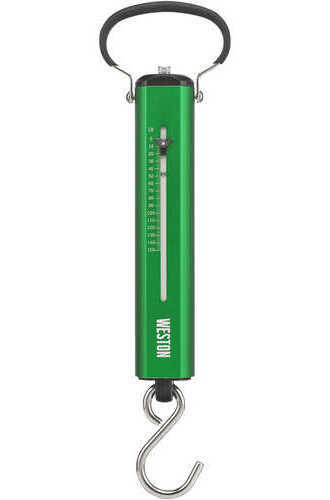 This rugged scale is powered by a built-in rechargeable battery and is equipped with a low battery status indicator. 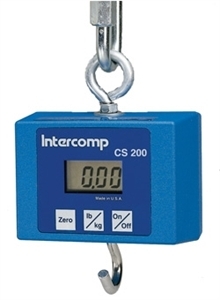 - Weighing Units: kg, lb. - Power: Built-in rechargeable battery with approximately 110 hours of running time per charge. - Operating Temperature: 41°F to 95°F. - Display Dimensions: 4.3" x 1.4". - Platform Dimensions: 9.1" x 7.5"
Low cost economical digital battery powered crane scale. All electronics are shock mounted in an ABS plastic case. This allows for basic protection against rough usage. High visibility 1/2" / 12 mm LCD digital readout provides easy reading of weights; membrane push button switches allow simple trouble-free operation. 4 Capacities to chose from. Compact, digital hanging scale in a durable housing with comfortable swivel handle and a large stainless steel hook for precise vertical weighing results. Other features include auto zero function on start up, large LCD display, auto HOLD-function after 3 seconds of stable load, tare function, low battery warning, and overload indication to help protect the load cell. User calibration. Capacity: 40 kg/88 lbs. Divisions: 10g/0.5 oz. Resolution: 1:4000. Precision: +/-20g/1 oz. Operating Temperature: 32°F to 104°F (0°C to 40°C). Total Length: 7.5". Folded Length: 4.7". Power: 2 AAA Batteries (included). 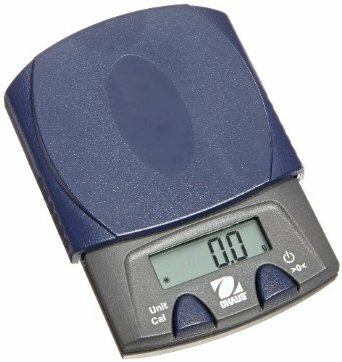 This compact digital hanging scale features an illuminated LCD with large digits, tare function, hold function to freeze and unfreeze the reading, calibration function, low battery warning, and automatic shut off after 2 minutes. The rugged suspension features a galvanized steel snap-hook and stainless steel S-hook. One-year warranty from the manufacturer. -Operating Temperature: 32°F to 104°F (0°C to 40°C). -Power: 2 AA batteries (included). 100 kg/220 lb. Capacity - Divisions: 100 g/0.2 lb. ; Precision: ± 100 g/0.2 lb. 200 kg/440 lb. Capacity - Divisions: 200 g/0.2 lb. ; Precision: ± 200 g/0.2 lb. These ultra-light, precise scales feature a tare screw with incremental rotation w hich protects against inadvertent adjustment, a colored marker ring for precise and clear readings, and a transparent tube for panoramic reading. Each scale comes standard with a crocodile clamp. 22.5 cm in length. Graduated in grams or grams and ounces, these easy-tare scales "zero out" container weights of up to 20% of the scale capacity. Made of corrosion-resistant stainless metal with an abrasion-resistant anodized finish, these scales feature a rotatable eye clip which comes standard with a crocodile clamp, but can quickly be changed to the optional hook when purchased separately. Metric and English graduated models feature Metric graduations on one side with English graduations on the other. Accuracy: +/-0.3%. Length 22 cm. 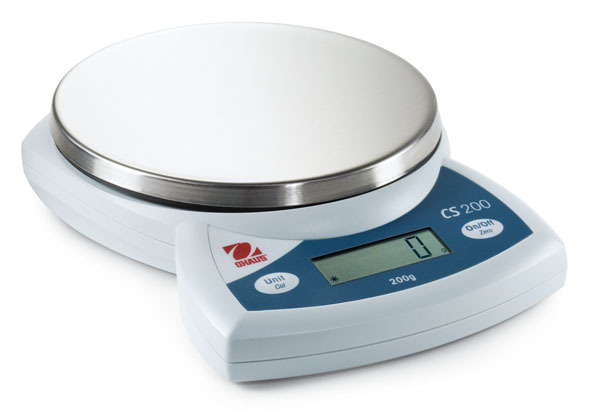 Graduated in grams or grams and ounces, these easy-tare scales "zero out" container weights of up to 20% of the scale capacity. Made of corrosion-resistant stainless metal with an abrasion-resistant anodized finish, these scales feature a rotatable eye clip which comes standard with a crocodile clamp, except the #42500, which comes with S-Hook. Scales work in any position, even overhead. Each scale features high quality, non-corroding components housed in an abrasion-resistant anodized aluminum case. Two-sided graduations are inversely proportional so you can easily read measurements from different positions. Metric models are listed, measuring in grams only. 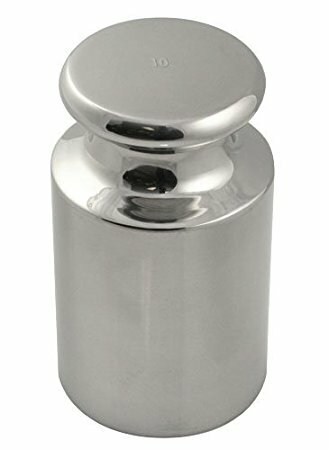 Tare screws allow you to "zero-out" the weight of various containers from 15% to 25% of the scale's capacity. Drag pointers measure the maximum readings obtained per weighing. All scales are accurate within +/- 0.3%. Handle and drag pointer included. Upper and lower suspensions rotate. Designed to withstand rugged use, this scale is equipped with an anodized aluminum housing that protects internal components. Also features a stainless steel hook and a non-slip grip. Capacity: 150 lbs. Graduations: 2 lbs. For use where a very rugged, heavy-duty, accurate scale is required. Graduations deeply etched for durability and protection. Adjustment screw for zero set. 3.25″ x 2.5″ x 19″. With hanging eye and weighing hook. - Easy to read, color coded graduations in both kg and lbs. Weigh boats are safe, economical containers for weighing liquid or powdered samples in the laboratory. Constructed of polystyrene with a smooth surface that provides accurate pour-outs with minimal sample loss. 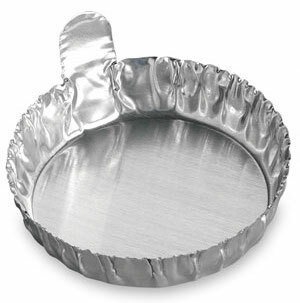 Versatile and durable, dishes can also be used as quick freeze trays for sample material, discard trays for broken ampules, or mixing trays for small batches. These metric masses are ideal for general-purpose applications. Inquire for sizes smaller or larger than those listed, for weight sets. 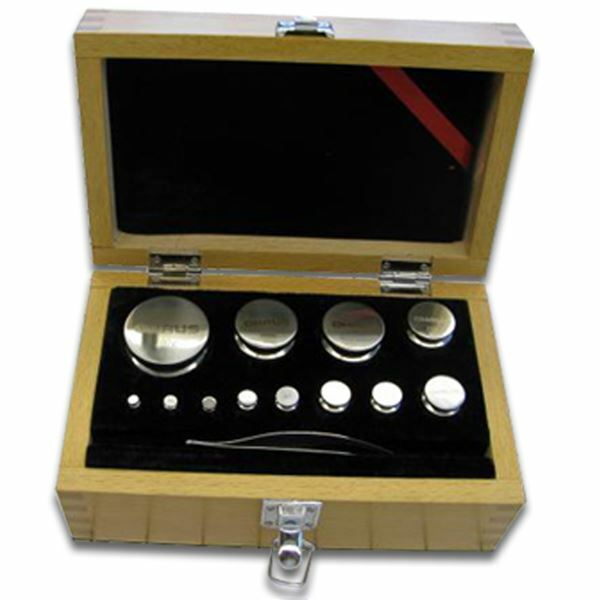 This 500 g x 1 g Brass/Aluminum Precision Weight Set (212-16) meets ASTM Class 6 adjustment tolerances and is ideal for applications requiring a degree of accuracy found in general purpose weights. Weights supplied in hinged plastic case. Kit consists of: 1x-500g, 2x200g, 1x100g, 1x50g, 2x20g, 1x10g, 1x5g, 2x2g, 1x1g.